Making this salad with less sugar and whole wheat noodles makes it a healthy treat for the entire family. Bring a large pot of lightly salted water to a boil. Cook elbow macaroni in boiling water, stirring occasionally until cooked through but firm to the bite, about 8 minutes. Rinse under cold water and drain. Mix mayonnaise, vinegar, sugar, mustard, salt, and pepper together in a large bowl. 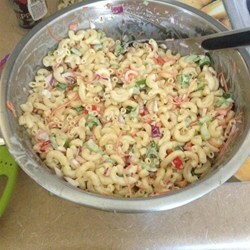 Stir in onion, celery, green bell pepper, red bell pepper, carrot, pimentos, and macaroni. Refrigerate for at least 4 hours or overnight, before serving.